→ 3×3 System Details: The 3×3 semi HPGe device was funded by a NIH grant in which Jim Patton was the PI, and was the basis for a collaboration with Fred Goulding, head of the LBL detector group. The detector and cryostat and special electronics were mounted on a stationary gantry and the patient was moved in a rectilinear raster to fill in data between the detectors to measure emissions from all parts of the imaged region. One mode of operation used individual focused Pb collimators placed in a bank arrayed over each detector with each collimator oriented to accept gamma rays coming in a perpendicular path (90.) from the object. This allowed reconstruction of planar views of the activity distribution. To produce longitudinal tomographic displays, a different collimator block (ensemble of collimators) was used. In it, each collimator in the bank was tilted so that they all shared a common focal point at a given depth in the subject. This provided preferential imaging of activity at the focal plane and we used the same reconstruction logic as with the Pho Con to reconstruct off axis planes (longitudinal and cross sectional tomographic images). 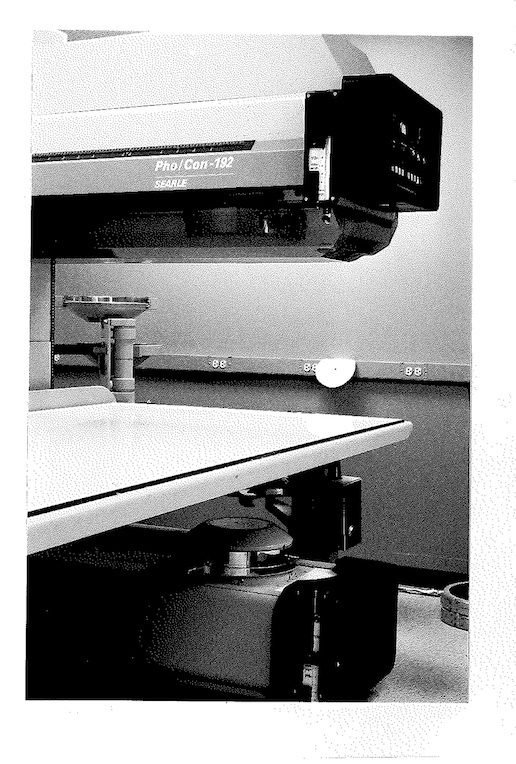 → VU Tomoscanner: The VU Tomoscanner consisted of eight detectors in a cylindrical geometry, each with a high resolution, deep-focusing collimator (pins for their manufacture were on loan from Bob Beck/ACRH). This was a key part of Jim Patton’s PhD thesis. Patton Dissertation. Each of the detectors were driven by a separate camshaft. Two separate motions were possible: 1). Back and forth angular rotations (an approach later marketed by Shimadzu/Japan), or 2). All detectors would simultaneously point toward a single region under the driving center of the system, sequentially allowing one to collect counts preferably from each voxel in the imaged plane. Using method 1)data from the eight probes were used to map cross sectional distributions of tracers in the body. When used in this mode the cylindrical geometry system was named Tomoscanner. It used 2” diam. NaI crystals, and standard photomultiplier (PMT) readout electronics. PMTs were connected through NIM modules to CAMAC buffer memories. When used in Method 2, the eight-fold enhanced sensitivity at the focal point made it also possible to Image fluorescent x-rays coming from differential amounts of a stable tracer when in the field irradiated by a focused Tc-99m radiation source. The excitation was produced by emissions sensed by the cylindrical array of detectors, when viewing fluorescent x-rays induced in the patient by excitation from a collimated Tc-99m “point” source attached to the under side of the driving center of the system that pointed at and followed the common focal point of the detector ensemble. This work was also part of Jim Patton’s PhD thesis. The initial planned application was to image emissions from a non-radioactive isotope of Bismuth as the candidate tracer that John McAfee had found to be strongly concentrated in brain tumors. The energetic X-rays from Bi, a high Z nuclide would have the penetrating power needed to escape the skull and be imaged. We used Cadmium collimators to reduce interference from lead x-rays. Pilot studies in dogs with spontaneous tumors were done with radioactive bismuth, and we found low tumor uptake. Had the biodistribution studies proved favorable and elemental toxicity acceptable, we should have pursued the application further. Bismuth had been used clinically in the treatment of syphilis, but issues associated with toxicity from heavy metals stopped further development of this fluorescent imaging application. The thyroid use of X-ray fluorescence system for nodule characterization was also of greater clinical interest, and was a major part of Jim Patton’s in depth efforts, as described elsewhere. → Orthoscanner: The Orthoscanner was the system for which RCA experimental integrated probes were designed. Harold Kroll and JudParker had worked together at RCA Lancaster to design thePDP9 PMT production control system. Given our interest in different arrays of probes, RCA designed an integrated Nai/PMT with electronics built into the tube base. This included Cockcroft Williams power supplies, preamps, amps, ADC, SCA, and line drivers. The multicrystal tomographic scanner was designed and built by David Pickens for his MS thesis. It consisted of 4 triads of collimated NaI detectors each oriented so that each member of a triad focused at the same spot. 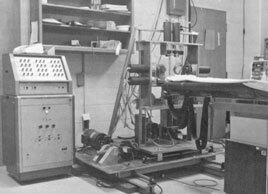 The detectors were mounted on a gantry with roller bearings with variable motion control so that data defining axial, sagittal and frontal planes could be collected and brain images reconstructed. David’s work was delayed, as we never had more than 8 or 9 of the RCA probes working at the same time. The non-working probes went back and forth by mail to RCA for repair. The selection of matched optimized components, and worst-case design considerations took longer than we or RCA had anticipated and that part of the project was terminated. David finally used the earlier standard NaI probes, as our more ambitions probe failed. Nonetheless, the Orthoscanner images collected were quite satisfactory using standard NaI probes. We believe that David’s system was the forerunner of the Cleon Tomography system, as their engineers visited us, studied the system in detail, with the unfulfilled intention to collaborate. David Pickens PhD. Dissertation was entitled Digital Tomography with a Single Photon Emission Focal Plane Scanner. In it he described the different established methods and systems developed by others, with his approach. His thesis also includes a detailed description of the approach he took by coupling the dual opposed scanning Anger Camera (PhoCon ) to a digital computer. These were displayed on film as longitudinal images and digitally produced images were displayed in transaxial, and oblique planes. Six Longitudinal bone scan images reveal details best seen at different depths. One of the big advantages of the PhoCon was that its thick NaI crystal made the best camera images of high energy gamma emitters, such as 67Ga and 131I images . For a review of the evolution of SPECT systems, see Jazsczak’s review of SPECT system developments which includes illustrations of the Vanderbilt systems described above.